And no, that’s not Cockney rhyming slang either. Given that neither side has conceded a league goal this campaign yet, Arthur Scargill 0 Ian MacGregor 0 might have been the most predictable scoreline of the whole weekend. Yet there was something a little, well, tough about this performance. And that’s in a good way. Tough to watch for a neutral, perhaps, but from an AFCW point of view it was the kind of game that gives one hope. We could have been sodomised sans lube, but we weren’t. Benching Piggy and Pinnock was an interesting move, so was starting Hanson and Appiah up top. Possibly done because we’ve got five games in a fortnight, including yesterday. Everything else was more or less in place, though. Including the Wardrobes. And even though they’ve clearly come back fitter and more mobile, you still get a mixed reaction to them depending on who you talk to beforehand. If you want a full, in-depth list of all our chances, just get a blank bit of paper and write “Soares shot” and “Appiah offside”. That’s all you need to know, and that’s all that was worth mentioning. ** – for some weird reason, it amuses me that that teams in Yorkshire really do sell Yorkshire Tea. I didn’t buy one, because I’d paid enough for the ticket/car park, but it was probably better than PG Tips. Then again, so is dishwater. We might have been undone with a bit more quality on their part, but we could have felt hard done-by if we had. It’s that word again : character. If we had gone a goal down, would we have put Pinnock on and given them a right go back in response? I’d like to think we’d do just that, and I’d go further and say that’s exactly what we would do. All right, we might not get anything out of it, but it’s nice to even contemplate that scenario. This really is a new season after all. Plus points: We didn’t lose. Solid at the back. Nobody played badly. Snuffed them out. Growing confidence. Minus points: Still wouldn’t have scored if we were still playing. Them: If they’re one of the top tips for promotion, we might not have too much to worry about this campaign. About as good in front of goal as we are, ditto their accuracy of passing at times. I do think they’ve got a bit more quality throughout the squad than we’ve got, however, so don’t be surprised if they do go up in May after all. Decent home turnout, but were pretty quiet. Either we shut them up, or they realised they’re not automatically returning to the Championship after all. As a club, Barnsley are a bit like Rotherham or Millwall. They’re one of those outfits that you always associate with them being in the second tier, but they seem to spend a lot of time in League One as well. Their whole setup makes you realise just how much more AFCW needs to build itself up (on and off the pitch) before we can even contemplate pushing to be in the Championship. Beforehand felt a bit like walking around Sheffield before we played t’Blades a couple of years ago, with that strange sense of expectancy that you saw with all the home shirts about (and just one Yernited and Liverpool shirt garment witnessed). Speaking of Barnsley town centre, I’m sure everyone was perfectly OK, but I wouldn’t say it was the kind of place to act up in. Especially if you have a London accent and/or have had one too many ales. Point to ponder: A thought whilst travelling northbound up the (thankfully serene) M1 : have we lost the fear factor this season already? Not just on the field, but off it too. By that, I mean that sense of dread that was the buildup to far too many fixtures last season. 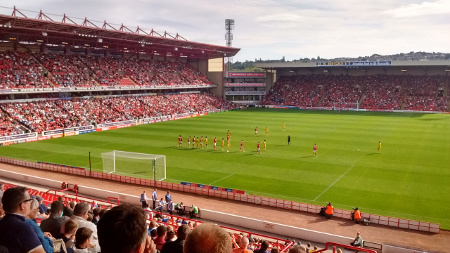 It’s early days in 18/19, and all that, but I didn’t have that horrible feeling going to Oakwell that I would have had last time out. We all remember how fragile our confidence back was, and that was throughout the whole club. Yesterday, we got a point without having our backs to the wall, and didn’t feel like we got away with it. That builds inner belief. With our back line in particular, you could almost leave them to get on with it already. We’ll let in a goal eventually, but it would feel like a genuine surprise if we put in a stinker. There are question marks over our front line, but it’s not panic stations this time around. Not yet, anyway. Yesterday, the talk was more of Hanson and Appiah not getting the service, rather than both of them being horseshit. Don’t forget that even in this defensive display at one of the L1 big beasts, we had the two best efforts of the game. And that’s without Pinnock. Both need a goal or three, that’s undeniable, and whether NA does get in that final striker (as he alluded to on BBC local radio yesterday) remains to be seen. I think we need another Pinnock-esque signing as well, but that may have to wait until January. Truth is stranger than fiction: 1) The Pinnock song to “Starman” by David Bowie. A genius composition which everyone loved, including the man himself by the looks of it. Pinnock, that is, Mr Bowie may find it difficult to show emotion right now. 2) Speaking of singing – the teenage girl outside Barnsley Markets who attempted to warble some modern day hits on a karaoke machine. Emphasis on “attempted”. Not sure who was more embarrassed – her, her mates or any passer by. 3) What tune did they come out to? Sounded very 80s-esque. Anything else? Yep, West Aaaaaaaaaaaaaaaaaam in the Carabao Cup. Worth finally qualifying for the second round after all, and undeniably a top tie generally. True, you might have preferred it at the Olymp… sorry, London Stadium, but it’s on telly and there’s a good chance of us gubbing their likely second XI. While it will be a sellout, one thing has become apparent – it’s not the OMG-WE’VE-DRAWN-THEM reaction that it would have been a couple of years ago. It’s undeniably a big game, and let’s not downplay drawing them, but this month alone we will have faced Coventry and Sunderland as well. While a previous SW19 update suggested we should never be blase about these fixtures – there’s a definite change in attitude to them. Namely, we appreciate them as very good fixtures, but we’re not like teenage girls when we get them any more. Christ, I remember drawing Slough Town in some cup competition when we were in the CCL, and thinking how immense it was because we were playing a team in a higher division. OK, there was still a bit of that when we drew Spurz at Wembley last year, which may be another reason why this upcoming fixture isn’t quite so “big” these days. But should we be surprised? In the last couple of years alone, we’ve had Bolton, Blackburn, Wigan, Millwall, Charlton and Sheffield United in the League. We’ve faced Coventry three times in about four years, and Sunderland are here this Saturday. Games against Luton, Portsmouth, Bradford, Plymouth and Oxford were considered huge ones initially, but now they’ve become de rigeur and you almost glance over them in the fixture list these days. I suppose it’s because for anyone who supported us in the WFC days after 1977, we’re merely going back to the games we had most weeks anyway. Reading one of the Barnsley message boards this morning, somebody pointed out we faced them in the last ever WFC era tie (the one where everyone turned their backs to the pitch). I have to admit I’d forgotten that, but it proves how much we’ve done a full circle in sixteen years. So, was it worth it? Yeah, I guess so. In a nutshell: Still unbeaten since Good Friday.